NMR has introduced a national disease testing service, Healthcheck, for IBR, BVD and Leptospirosis using bulk milk samples. 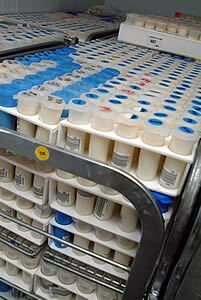 For many producers the milk samples used for these tests, and for testing for Johnes disease, can be drawn off those already collected as part of the payment testing scheme run by NMR’s company National Milk Laboratory (NML). “NML collects samples every day from 65% of British dairy herds,” says NML’s Ben Bartlett. “One sample is used for payment testing at either the Wolverhampton or Paisley laboratories, then five subsequent samples are held by the lab for traceability purposes and to allow additional testing if required by the milk buyer. These samples may also be used for disease testing at the request of the producer. The routine Healthcheck service for all three diseases – IBR, BVD and Leptospirosis – costs £50 a year for quarterly tests or £15 for a one-off test. Results are sent back to producer with copies to their vet, or other third party, by email, fax or post. A number of vets are already taking advantage of NMR’s Healthcheck service and, with permission from their dairy farmer clients, they are contacting NML to request appropriate testing services whenever the need arises. “This innovation from NMR, using their NML collection, storage and testing facilities is a huge bonus for us because it is as near to hassle free as anything is likely to get,” comments James Allcock from Cheshire-base vets Lambert, Leonard and May. All three diseases currently covered in the Healthcheck service are prevalent, at sub clinical levels, in many herds. IBR, which can affect production and fertility, is found in around 40% of UK cattle, but it is estimated that as few as 20% of herds are vaccinated. The BVD virus is estimated to be present in 95% of bulk milk tests, but only 30% to 40% of herds vaccinate against it. Cattle infected with BVD have increased susceptibility to other diseases and high on-farm losses, through reduced fertility and loss of production, are associated with BVD. Leptospirosis is characterised by milk drop, infertility and abortion. It is estimated that around 30% of herds are vaccinated for Leptospirosis. Producers can request the Healthcheck service by contacting NMR Customer Services on 0870 1622547.